Another King line goes down. 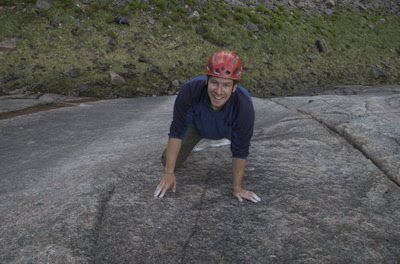 Donald King’s second tip off of the summer was the big traverse project at Kentallen. I blogged about it a while back. It was looking like F8c until last night I found a couple of killer tricks at the crux and Donald found another kneebar right where you need it. Feeling light after the diet, I went for a link attempt and got 20m along, right above where I’d peerched my brand new compact camera and proceeded to rip an undercut off, land right on my back on my camera, and roll about in pain for a while. After a rest and regaining my dignity. I dispatched it next go. Classic 8b+/ Font 8a if you are good at undercuts and kneebars. It reminds be of a burlier, and longer (35 metres) version of the classic staminaband at Raven Tor. But with a rather more impressive outlook as you can see, and minus the polished holds of course. 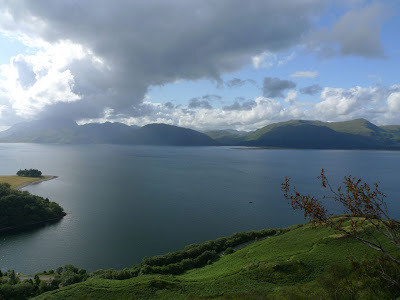 The outlook from Kentallen crag, across Loch Linnhe to Ardgour. Nice eh? If you fancy a go, it’s a good place to know about, stays dry in mild rain, and ten minutes south of the Ballachulish Bridge. 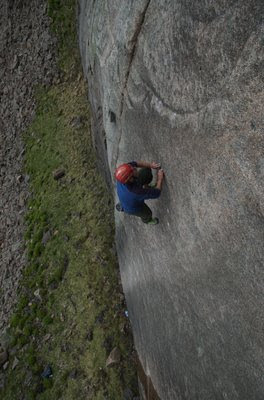 There are lots of nice straight up problems too from easy to V6. From Ballachulish head south on the Oban road for five minutes or so and drive through the village of Kentallen (you can see the crag on the hillside directly above the village). Just out of the village, as the road goes uphill a bit, park in a layby in the trees. Walk up a ridge going diagonally back up the hillside to avoid slaving through the deep bracken directly below the crag. Start bridged in a small corner at the right end of the crag. Swing round left on a rail and drop under to big undercuts and start burling leftwards (be a little strict here and don’t use the little back wall at the bottom). Continue past a couple of knee bar rests for some way to increasingly hard and technical moves pulling up into a corner before the crags breaks up at the left end. 35 metres of great steep climbing. 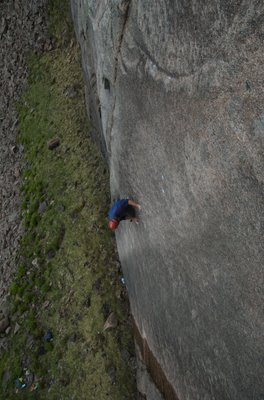 Linking Death is a Gift 7c+ into Ubuntu 8a to make a nice 8a+ for the Camel near Inverness (note the rain falling - another wet weather crag in Scotland is really wirth knowing about). I’m fed up waiting for the weather to get ready to travel back to my project, so I’m just gonna go there in a few days and hope for the best. Preparing has been fun at times and a grind at others. I had about 30,000 words of writing work to do over the past 6 weeks. Sending off the last of it hopefully tomorrow afternoon. Ouch! The first of these were training programs and two of them seem to have already helped realise some long term climbing goals which is always really heartening and spurred me on to pile through the rest of the work. But it’s meant some long nights. 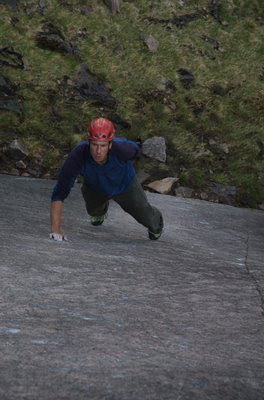 The writing has mostly been private training programs but There are also public features from me heading for Climb Magazine, Scottish Mountaineer, UKclimbing.com and others. 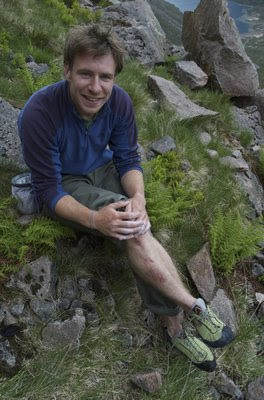 If you haven’t looked lately there are also a couple of new articles posted on my climbing coach blog. I’ve been trying to do a Redpath and hit my board after midnight when I finally can’t face another hour in front of the screen. But the other night I knew it was a lost cause when I kept dipping my hands in cup of tea instead of my chalkbag. A lie in later, I nipped out with Claire and got revenge on the Gift-Ubuntu linkup at the Camel I fell off due to wastedness the other week. The autumn’s training should be good because my board is so good I’ve been almost hoping for more rain so I can get more time on it! Scary eh? I have thought much about how to achieve fighting weight for a serious try on my project; always one of the hardest parts of climbing for me. A new strategy has worked extremely well in minimising the psychological torment and shifted 1kg. Feeling a million times better for it. Until project time, there is time for one more article to do and hopefully one more session on the Kentallen Traverse proj. I’ve had enough. Unless there is absolutely no other alternative, I’ve had my final Ryanair flight. A sign of getting old and grumpy? It’s possible. But I don’t think thats the issue. Do I care? Not a bit. It’s the first time in my life I’ve got so irritated by a business service that I’ve decided to spit the dummy and boycott even if it means some serious inconvenience. I’ve moved on from stuff before that I’ve felt is falling short of where it could be, to a better alternative. But never with a vow never to return. For example, I finally went from Microsoft to Mac after several years of hoping Microsoft would get good enough to make me want to stay. I got fed up waiting. But if they get good again, I’m not bitter and I would look at them again. It’s perfectly forgivable not to be leading the race all the time. 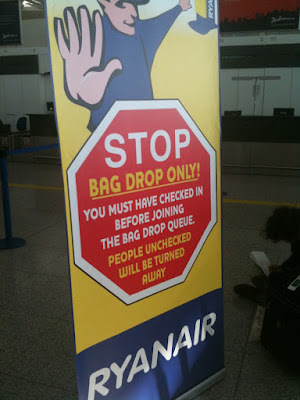 But Ryanair, in my world, are history. Maybe eight years ago, lots of people had good things to say about them. They seemed to be really working hard to make things better for us. In the past year that regard has finally slipped into loathing every move they make and grudging every pound we spend on them. I haven’t talked to a single recent user of their flights who hasn’t felt the same. For any of you who regularly fly with them and especially those like myself who work around Europe, I don’t need to go into why this is. For those who don’t and are curious, some stories are here. But it boils down to capitalising on the fact that folk are busy, are creatures of habit and can’t always research the alternatives and using that to make opportunistic raids on the wallet once you are backed into a corner (at the airport). Also, leveraging an infrastructure and weight in the airline industry to bully us into doing travel their way. I’ll watch how this story unfolds with interest from the sidelines. I’m highly curious to know if this massive company have gone off the rails and are throwing away everything they’ve built up for the sake of greed, arrogance or foolishness, or do they really know what they are doing? I would have thought that starting every other customer’s flight by hitting them hard in the wallet from behind as they reach the airport would be something customers would hold long in the memory? Especially when you make them stand in a massive queue to make them pay and give them plenty of time to deepen the hatred. How can this make business sense in the long term? It will be interesting to see. When they go bankrupt I’ll smile. If they are still as big in five years time I’ll shake my head in amazement at the courageousness of this experiment in bold business. Good luck to them, I think they’ll need it. Full disclosure/update: I’ve still got enough fizz to write the above post over a week after the flight in question. So it’s not rage, just deep dislike of what they are doing. A quick google of ‘we hate ryanair’ demonstrated I’m far from alone in my frustration and led to me becoming the 2623rd member of the ‘we hate ryanair’ facebook group LOL! 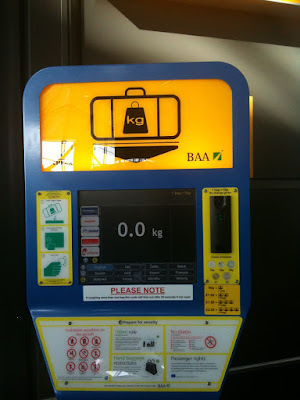 Ryanair provided some handy scales at the back of the queue. You pay to wiegh your bag, so you can discover how much you have to pay again when it’s a wee bit too heavy. I write via my phone from a random stopover in a motorway services, heading south to give a lecture and some coaching at a climbing wall opening in llangorse, south Wales tomorrow (Wednesday). Maybe see some of you there? 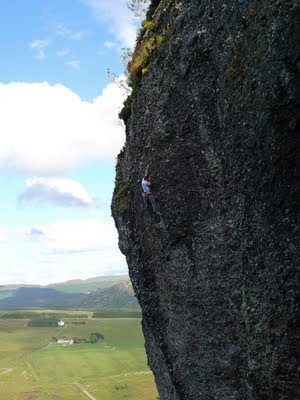 Yesterday I ended up climbing at the camel with Blair and Murdo. I was wasted after a monster session on my board the previous night. I attacked the board with the kind of lemming like zeal you only get after a week of working away from home with no opportunities to train. I had been away at the outdoor trade show in Germany, more on that later. So, mind and body were still somewhere else, but after a flash of the recent new route Death is a Gift 7c+ (ominous name eh?!) I breifly woke up. Not enough to onsight my friend Dave's route Ubuntu (8a) though. 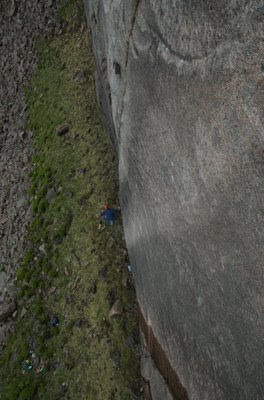 After seeing this off comfortably next try, the previous nights board pounding really started to show and the obvious link up of both routes ended in a stupid mistake at the crux. My mind was just as absent as the glycogen in my forearms. It's been some time since I climbed so poorly. A good call to action. I'm lucky that my work period is almost finished and I should be off for my first decent stint on my new project. Fingers crossed for settled weather in the north. Where’s that foothold!!!?? 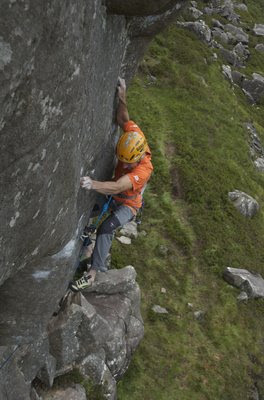 Pulling hard on the crux of Present Tense E9 7a, Seanna Mheallan. Photo: Claire MacLeod. Click on the pics for a bigger view. Since I last blogged, I have been on several amazing pieces of rock. One of them could yet be another E11, and a very special one at that. Perhaps I wouldn’t be good enough to climb it right now, perhaps I could get good enough? 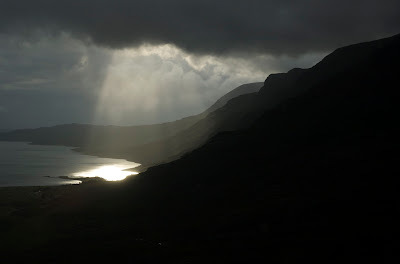 Thinking aloud already… More on that as the summer progresses… But my impatience in the short term has been to return to Seanna Mheallan in Glen Torridon and the two other beautiful sandstone projects there. Left of the arete of Kolus I climbed a couple of weeks ago, the front face of the buttress is steep and bulgy with two lines to climb, going up past a fridge sized block neatly stuck on with only a good undercut below it and a perfect friction sloper hold on top. One line was to bear-hug up the fridge block and do a weird rotation palming move into the niche on the left - sort of like the move at the top of the groove on Gaia, but a fair bit harder. The day after I was first trying the line, I was wrestling an old 1970’s Kelvinator fridge out of my new house and into the back of my Micra (which is at least 80’s!). It reminded me of the day before on the project! So first off, I headed back up and got that one led - Kelvinator E8 6c. 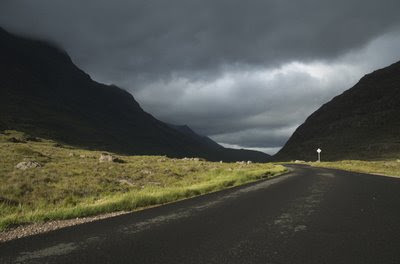 It was raining steadily (but lightly) for the entire day, but I was allowed about five minutes of dryness and the now familiar baltic Torridon ‘summer breeze’ to make my chance. But the direct line above the fridge block continued to seem impossibly technical. Another day spent with Michael dangling on the ropes in the rain allowed me to at least find a way to make the holds work for one particular move, squeezing pathetic sidepulls while clamping the Kelvinator block with your feet. The link felt like solid F8b. Originally I suspected this would come in at E10, but the discovery of two highly unlikely micro wires eased back the chance of a 15 metre groundfall from the crux to something noticeably under 100%. Yesterday, Claire and I rendezvoused with Jamie and I was feeling very confident and determined I wasn’t leaving without the route under my belt. I’d planned my tactics well for the order and timing of warmup tasks, as you can for this sort of crag. So many more things are under your control than on big mountain crags. I really noticed that. If you are on top of tactics, you can get a lot more out of yourself. So, as you might expect, after much to-ing and fro-ing, running around to get to a good temperature, and getting rid of some nerves, I found myself on the sharp end of the rope, staring at the hard moves. My game was to say inside that the wires were solid, and this was a sport route. That was all fine until I stood up out of the block, left hand not perfect, body position wrong and I couldn't feel that crucial good bump in the rock under my right toes. Where is it! Where is it! A long three seconds passed while I fumbled the foot, fingers opening. Nothing for it. Options are gone. Throw for the hold in the next second or you are testing those micro wires. At this point, I struggled to hold on to my hypnotic delusion of safety. Time to grit the teeth and stay alive! The next move was a mess, But then I came off the other side of the adrenaline spike and the inevitability of it kicked in. Keep fighting and see if you come out the other side. I did, shaking and laughing at suddenly waking up on the easy slab, Claire beside me on a rope still pressing that camera shutter like nobody’s business. The sun comes out just as we arrive back at the car, after the whole day in the rain. Thats Scotland! It’s at least a week before I can travel back to the aforementioned E11 project. This week I am working for my sponsors at the outdoor trade show in Germany. See some of you out there maybe? 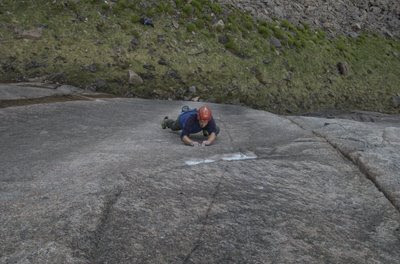 Gaz Marshall getting ready for a rollercoaster ride on Firestone E7 6b, Cairngorm. Click on the pics for a bigger view. 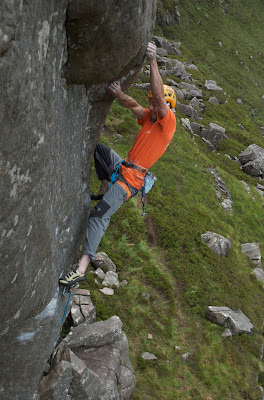 Last week I had an excellent day out with Gaz over on Hells Lum. Gaz was after his first E7 and had been working on the unrepeated (?) E7 Firestone by Julian Lines. Firestone is a perfect piece of granite. Worn perfectly smooth by ice and water, it’s quite beautiful to look at. It’s also quite weird, if you stand on a particular part of the hillside, it looks easy angled enough to almost run up. I can tell you, it doesn’t feel like that when you are on it. Gaz was clearly juggling the sense of being within striking distance of leading his project that day with the questions about when is the right moment to go for it. How much des excitement cloud the judgement. Only experience tells you. And experience is got the hard way and no other. So, he went to find out, and started padding up the slab. I hung on a rope and shot pictures for some time as he got higher and higher, but suddenly became aware that he’d stopped one move before the end of the difficult section, and everything had seemed to go nauseatingly silent. Still looking through the lens, I felt my mouth go dry as I watched him try several times to replace a sliding foot before suddenly launching both hands into the air, windmilling wildly and shouting “NAHHH I”M OFF”. I wondered what to do. As he turned and fell, I realised I was most likely about to watch a mate break his legs. So quick thinking allowed me to put off bracing myself for it by simply carrying on shooting pictures as he went for the big ride down the slab. I can tell you he was going pretty damn fast by now! 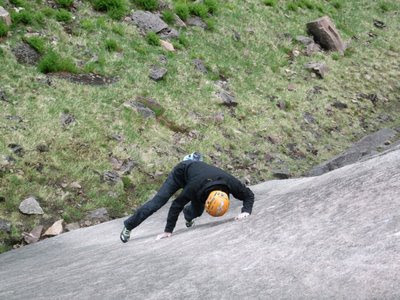 Impressive body pasting to maximise sliding friction, together with a fine land-and-roll down the boulders technque. Allowed Gaz to take the 12 metre fall, then get up and start laughing his head off. Thank god for that. 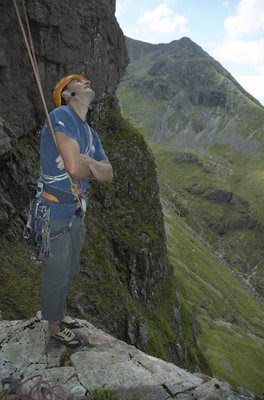 Claire reckons it’s witnessing scary climbing antics from behind a lens than from belaying. But this did me little good when it was my turn to solo Firestone next. I made it, but I must say I prefer having holds to squeeze harder when I get scared. Full points for steeliness went to Gaz though for limping back over to the route, walking wounded, and going back up it to finish the job! A fine example of grit you don’t see very often now. This doesn't really need a caption, does it? Gaz’s blog about the adventure is here. Onsighting Prophet of Purism E6 6a Glen Coe. The number of runners clipped to the rope give away what this climb is all about. 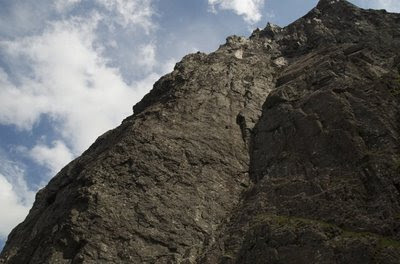 During the early nineteen eighties in Scotland, any climbing was trad climbing, and the focus for the best climbers of the day sounded like it was very much about how death defying the climbs were, rather than difficulty, as things have leaned to these days. Or at least it certainly was for Dave Cuthbertson, who was climbing better and bolder than anyone in the country at the time. Dave’s drive was to push himself further and further towards the limits of being in control with the maximum possible constraints and risks in the climbing situation, and try to stay on top [i.e. alive]. The more intimidating the cliff, the poorer the protection, the purer the style the better. Even talking to Dave about loose rock, he tells me “I used to revel in all that stuff”. 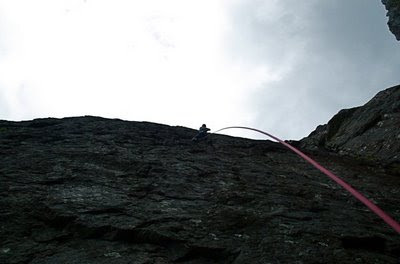 Most of the time on Scottish mountain cliffs, climbing new routes onsight (in the modern sense) is either a pretty messy business, or a suicidal one. One some cliffs, like Lewissean Gneiss, it’s no problem, the rock is clean, sound and the routes tend to give many of their secrets away on visual inspection from below. On others, dirt and loose rock would make climbing first ascents onsight a reliable path to an early grave. Of course it’s fine up to a certain grade (for most this might be the mid E-grades). But as soon as dynamic movement comes into the equation the risk spirals and rapidly overtakes the romance of the ideal. 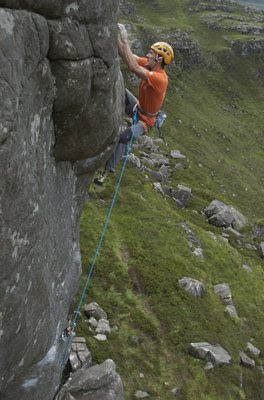 The highpoint of this highly dangerous pursuit, for me at least, was Dave’s onsight first ascent of Prophet of Purism E6 6a in Glen Coe. Naturally there have been better performances since, but often on more predictable rock types like granite or Gneiss as I mentioned before. But to climb this overhanging wall covered in hollow snappy loose edges with so little protection has always seemed to be an outstanding example of sheer bottle. It’s what climbing used to be largely about for many people, and although its well out of fashion now, it still impresses. Or at least makes us shake our heads in disbelief. And inevitably more so if you hear the climbing story first hand. Dave told me about doing a massive traverse across an overhanging wall, pumped and committed and facing a 20 or 30 metre fall and swing into the slabby bluffs beneath the wall. 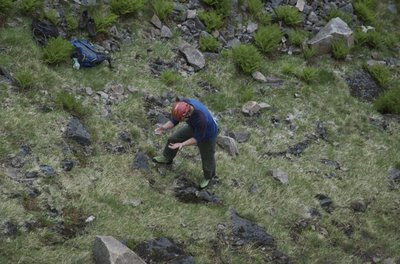 At the end of the traverse he ended up grappling in extremis on opposing press holds in a niche which was completely overgrown with wet moss, slipping and gasping for breath and calm. I figured, at some point, sooner or later, I better go up and try it myself, if only to have a shadow of this experience. 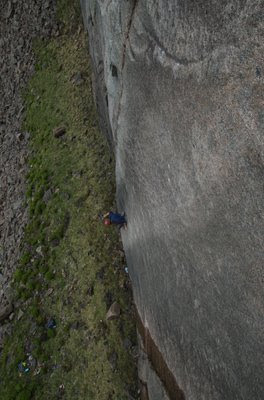 Dave launched across this traverse into the blankness of glen Coe wall without the knowledge of what was across there - a block pulled off, a move too hard, and a terminal fall. 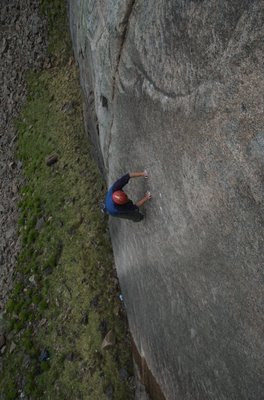 I launched across it knowing it was E6 6a, and most of the holds tested for me. Still, it was very cool to pull quickly into the niche, not realising and stretching from a press to another and suddenly dawning that I was in the same move as Cubby told me about. Because I could relax in the knowledge that no really hard cruxes were coming, I felt ok on the traverse and was feeling like the final ten feet of overhang above should be a jog for home. But every hold felt totally detachable, 35 metres up and without a runner that would stop me. Sensitive climbing with a very reserved and calculated movements does get you through loose rock climbing, but I’m no expert at it. Maybe it was because this part wasn’t even worth a mention for Cubby that gave me a wee fright because I thought I should be home and dry by this point and had relaxed too much. I had the gift of being able to play the game of telling myself “these holds have been pulled on before, they won’t come off!! After a hurried grapple over onto the Big Top flake, I took a moment to respect a very very bold standard by Cubby to be able to keep cool on this terrain without knowing which holds would take his weight. 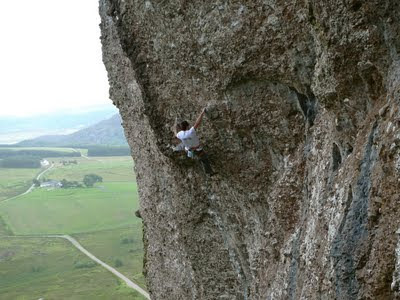 I’d like to try a modest experiment in this type of climbing shortly, and know a line that could be around E7. Nearly 30 years after Cubby did Prohpet of Purism, the game wont be too much different. Fitness will matter a little, sure. But this game comes down to what is in your head. Interesting stuff. The prophet wall on Aonach Dubh, Glen Coe. Prophet of Purism goes up the right side of the wall before doing a massive traverse line across the wall to eventually gain the left arete (Big Top).